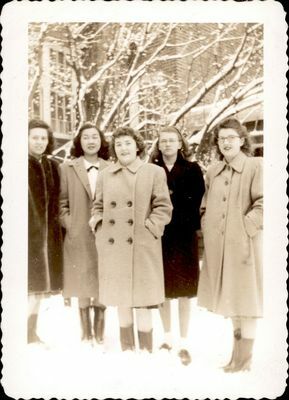 Photograph of Jan Hoffman, Frances Sakumoto, Phyllis Mallory?, Billy (maybe Rogers? from Maine? ), and Eleanor Pishea (spelling?) standing outside in winter. They are all members of the class of 1951. Donated by Hannah Roberts.